Here's a sampling of Leopard-themed hints provided by the readers of MacOSXHints.com. Whenever possible, we’ve used the real names of the users who provided the hints. In some cases, when they prefer anonymity, we’ve used their screen names instead. 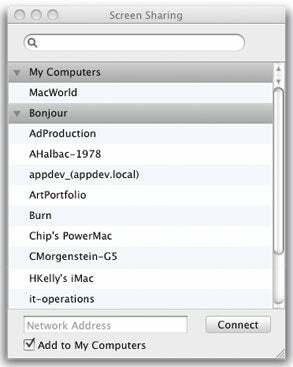 Bonjour Browser: Using the hidden Screen Sharing utility and a Terminal command, you can get a list of Bonjour-accessible computers whose screens you can share. Customize Screen Sharing: The second button in the row (A) switches between letting you control the remote Mac (the default) and simply observing the other machine. The next one (B) switches between allowing the person at the remote Mac to use its keyboard and mouse (the default) and locking him or her out. The fourth button (C) locks the other Mac’s screen, displaying an all-black background, a huge lock icon, and any text you enter after clicking on the button. The fifth button (D) captures the remote Mac’s full screen to a local file; the system will ask you to pick a name and a save location. The sixth button (E) toggles between windowed (the default) and full-screen modes. In full-screen mode, the toolbar floats in the upper left corner of the screen. To exit full-screen mode, click on the X in the toolbar. If screen updates are going slowly, you can use the slider (F) to reduce the image quality—all the way down to a badly dithered black-and-white view—and speed things up. Leopard’s stacks have met a mixed reception, but I’ve found that I can increase my productivity by creating a Working stack for projects I am currently working on. (First I create a Working folder in my home directory, and then I drag it to the Dock). When I start to work on a project, I drag aliases for all the relevant files into that Working stack (by holding down Command-option as I drag the files to the Dock). I then have quick access to all my current files. 1. Files & Folders: Get Specified Finder Items Specify the Working folder you created in your home directory. 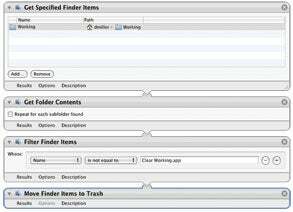 Clear Working.app: With this Automator workflow in your Working stack, you can clear out that folder with a single click.